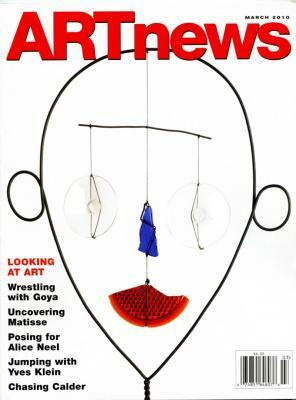 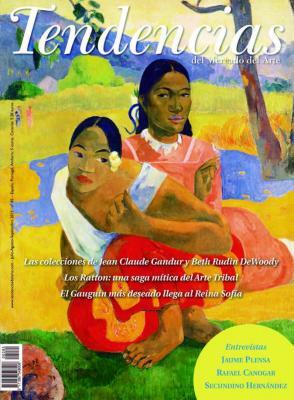 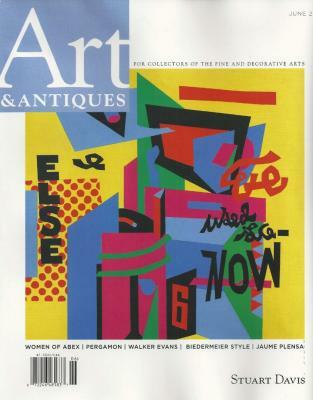 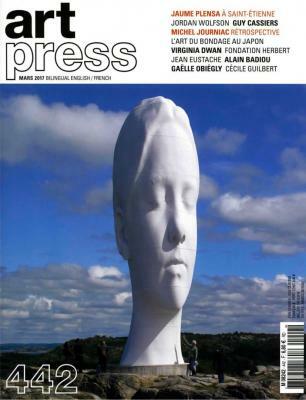 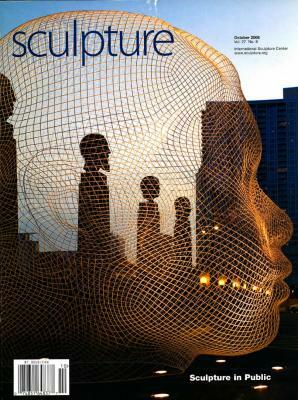 2017 - Tendencias del Mercado del Arte, Nº99 - January 2017 - "El Sueño Eterno"
2017 - Artpress, Nº 442 - March 2017 - "L'espace intérieur selon Jaume Plensa"
2017 - The Brooklyn Rail - February 1, 2017 - "Jaume Plensa with Laila Pedro"
2016 - Art & Antiques - June 2, 2016 - "Heads Up"
2016 - Connaissance des Arts, Nº 746 - March 2016 - "Jaume Plensa, quand le mot prend corps"
2015 - Tendencias del Mercado del Arte, Nº 85 - July, August and September, 2015 - "El alma al aire"
2015 - S Moda / El País, Nº 182 - March 14, 2015 - "Esculpir la emoción"
2014 - The Wall Street Journal - June 13, 2014 - "Spanish artist Jaume Plensa sends four heads to Chicago"
2014 - Chicago Tribune - June 17, 2014 - "Expanding his artistic mind"
2013 - Llei D'Art, Nº9 - January 2013 - "En el Estudio de Jaume Plensa"
2011 - The Wall Street Journal - February 1, 2011 - "The Man With a Thousand Faces"
2011 - La Vanguardia Cultura - January 30, 2011 - "Mi Obligación es Crear Belleza"
2011- New York Times - May 8, 2011 - "Monuments: The Poetry of Dreams"
2010 - ARTnews - March 2010 - "The Man with a Thousand Faces"
2010 - Ars Magazine - July–September, 2010 - "In Jaume Plensa's Workshop, Speech and Matter"
2010 - Arte al Límite - May 2010 - "Jaume Plensa, Obsesiones del Espacio y la Diversidad"
2010 - Digimag September - "The Poetics of the Intangible. 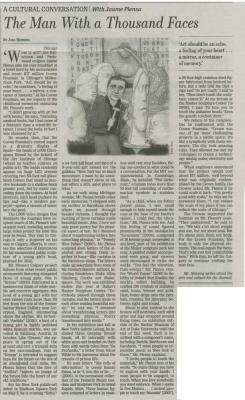 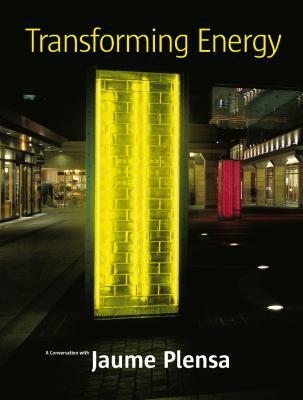 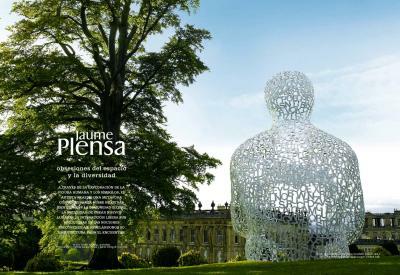 A Conversation with Jaume Plensa"
2008 - Sculpture Magazine - October 2008 - "Jaume Plensa, The Shock of the Known"
2006 - Sculpture Magazine - March 2006 - "Transforming Energy. 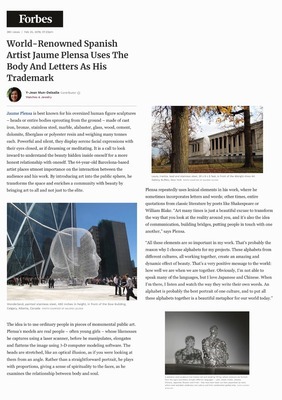 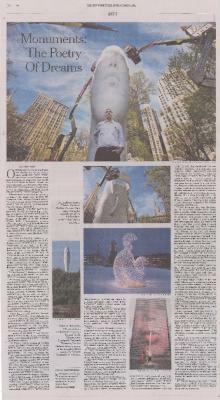 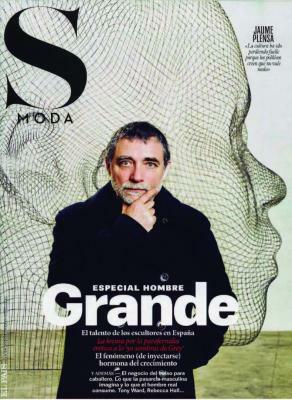 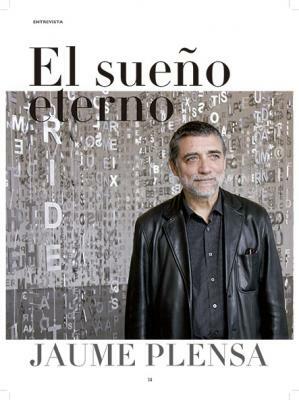 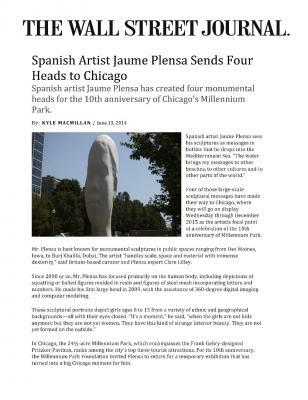 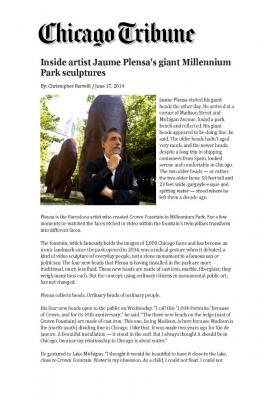 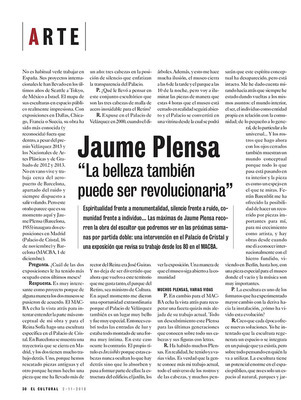 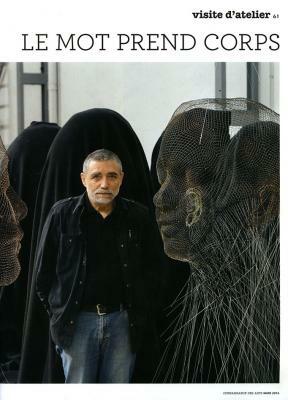 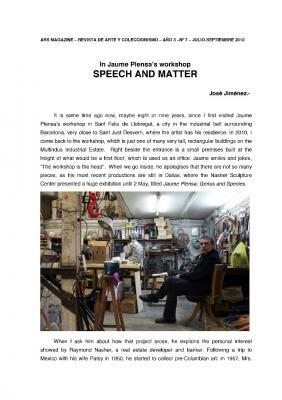 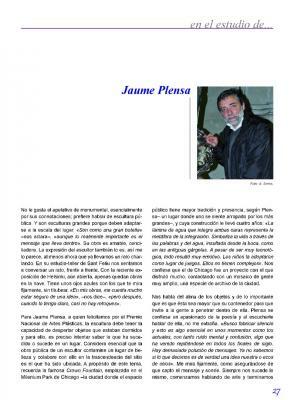 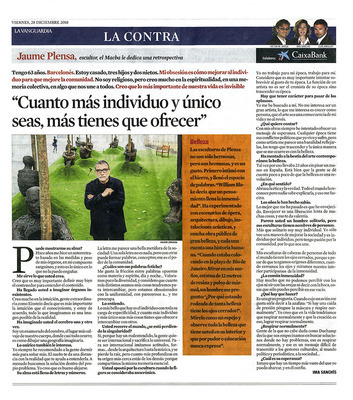 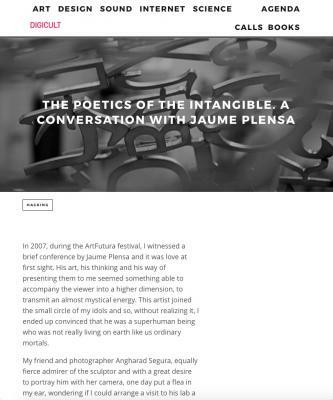 A Conversation with Jaume Plensa"